Offlate Rishikesh has become a hot spot for adventure water sports, river rafting is the most popular among all. In Rishikesh anyone having an adventures outlook can go for river rafting as different streaches of ganga provide varying degree of difficulty. For anyone watching river rafting on TV, the sight of paddlers navigating treacherous waters with sublime skills may make it seem an easy task. But in reality, it calls for extreme capabilities and nerve, not to mention fitness levels, to navigate the rapids.  On the Ganga river, however, some stretches where the river flows peacefully can prove tempting even for those who may not have the nerve or ability to raft on the rapids. Indian River Running Association organizes Four Square White-Water Rafting Challenge every year in the months of March/April at Rishikesh. Many teams from all over India participate in the competition to give a display of their talents. Any person who is medically fit can participate in this competition, by paying an entry fee. All rivers could be graded on a scale varying from grade 1 to grade 6. The grading indicates the state of water stretches and the skill level required to negotiate them. The same river could be graded differently at different places and grading also depends upon the time of the year, i.e. monsoon or non-monsoon period. Rivers rapids are graded as follows, and it is a good idea to check the scale with your guide before setting off. Grade mentioned on this site belongs to non-monsoon season. River rafting activities in the Ganges are completely closed in monsoon period. 1 Grade-1 Very easy with small rides. Anyone can do. 2 Grade-2 Easy with small rides or few rocks. Anyone can do. 3 Grade-3 Easy with small rides or few rocks. Anyone can do. 4 Grade-4 Medium waves, drops, rocks and sharp turns. White water experience required. 5 Grade-5 Large waves, large rocks and hazards, possibility of a large drop, requires precise maneuvering. Professional white water experience required. 6 Grade-6 Considered as dangerous. Rafters can expect to encounter substantial whitewater, huge waves, huge rocks and hazards, and/or substantial drops. Likelihood of serious injury or death. 1. Always take proper Rafting Gear such as life jacket and helmet. 2. Never be in the raft after sunset. 3. Always go with a guide as they are familiar with Waters & Rapids. 4. Never go in a rapid which you cann't negotiate. Bhanu Complex, New Mahavir Nagar.